Welcome to Suzanne's New Bargain Finds! Occasionally I am stunned when I find a business where the proprietor was on hand, knew the business and product in and out, told the absolute truth and was looking out for the consumer. How rare. Savon Appliance in Burbank has been around for over 30 years selling used appliances directly to the public at savings of 30%-70% off the original price. Everything is completely reconditioned and ready to work like new. 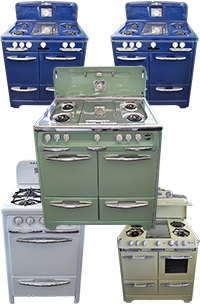 From classic 1950's OKeefe and Merritt stoves to a 2002 Kenmore washer were here, all priced to move. My visit started with the stunning revelation that they had an old Maytag washer & dryer set that was exactly like my moms. Priced at $400, I had to ask why this 40 year old set wasn't priced better. The 10-minute dissertation I got on the quality, content and superb functioning of a Maytag from that year left my mouth hanging open. I really had no idea that newer large appliances were so poorly made. I had to admit that my moms washer had only been serviced once in 40 years... yeah I grew up with it and it never gave us any trouble and always did a good job of cleaning. When I balked at the price on the old Maytag she showed me a newer Kenmore set for $350 but said it wasn't built near as well and showed me specifically why. There was a lot of the old try and true brands here: Kenmore, Amana, Maytag, Frigidaire, and the like... Good brands when they came out. I didn't see any Sub Zero, Thermadore types here at all. Just older appliances re-serviced to work like new. Marsha went on enlightening me about newer appliances. The problem she said of the newer energy efficiency appliances is that most didn't last long enough to save enough energy costs to buy a new one. She also carries those classic Wedgewood, and O'Keefe and Merritts stoves. Here they completely recondition, re-chromed, re-porcelain and re-calibrated. They were not cheap and ran $1000-$5500. I have seen them in seriously battered condition for $300-$800. But the market price for a completely restored classic stove can run you as high as $7000. So the pricing here was fair. Again, once you have someone to tell you why these stoves are so far superior to any stove on the market, you'll never look at a Sub Zero again. Savon not only sells used appliances but also repairs them and sells parts. So you can get the old O'Keefe and Merritt parts to keep your stove working and Marsha will even show you how to calibrate the oven and burners.